In the sometimes-shady business of big-time college football, it’s tough to tell exactly who’s winning how much once you delve into the economics of the game. On the field, however, most would agree that the biggest winner of the past year was Jameis Winston, the Florida State quarterback who claimed the Heisman Trophy and led the Seminoles on an undefeated run to the national championship. Winston’s FSU teammates and coaches would also fall into the “winner” category. And for many sports fans and media, that’s it. According to their code, the list of winners is short and exclusive, while the rest of 100-something teams and 1,000-something coaches and 10,000-something players on the NCAA Division-I level are losers. Because if you didn’t take home the national title and you weren’t recognized as the best player in the country, what did you really win? And then you consider the story of Muhammad Saifullah. The 2013 season was Saifullah’s last at the University Kentucky, where as a 5-foot-7, 170-pound senior wide receiver and kick returner, he was an unheralded player on an unheralded team that finished in last place in the Southeastern Conference (SEC). Saifullah wasn’t just a backup. He didn’t play at all, seeing zero game action during his two seasons on the Wildcats’ roster. His role on the team explains his Twitter handle: @TheUKRudy. A three-sport athlete at Bryan Station High School in Lexington, Ky., Saifullah was only recruited by a few small colleges to play football. One Division-I program offered him a spot as a “preferred walk-on.” He landed at Division-III Centre College in Danville, Ky., and after one season there, transferred to Kentucky. 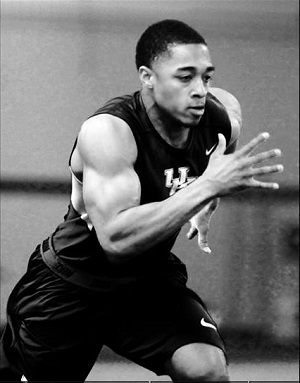 He tried out for the Wildcats in 2011 and made the team. Saifullah took the 2012 season off after the birth of his daughter, but when he was ready to return in 2013, the UK coaching staff he’d known had been replaced by new head coach Mark Stoops and a staff of new assistants. Saifullah had to try out again. He made the team again. But he never played a snap, and his team went 0-8 in the SEC, 2-10 overall. So would you call Saifullah a winner or a loser? Consider that this man who would be considered an undersized point guard in basketball fought for and won a roster spot — two times — in the toughest college football conference in the country. Consider that during that time, he became a father and a husband. Consider that he is on track to graduate with a degree in kinesiology and has a standing offer to begin his career with Kentucky’s strength and conditioning staff. That’s not the resume of a winner? UMMAH SPORTS: Tell me about your sports background. Did you grow up playing football? MUHAMMAD SAIFULLAH: My pops put me in pee-wee league when I was eight years old. I’ve played football ever since then. I also ran track and wrestled in high school. But I was only doing the other sports to stay in shape for football. What schools recruited you for football? I didn’t actually break out until my senior year in high school, so the majority of my offers came from D-III, D-II and NAIA schools. Some D-IAA schools offered, and only walk-on spots from D-I schools. I had offers from Butler, Morehead State and Valparaiso. Louisville offered me a preferred walk-on spot. No offers from UK. But I decided to come to UK because I always knew that I could compete at the Division-I level and UK was in my hometown of Lexington. I also knew I wanted to come to UK after a scrimmage we had against them when I was at Centre. I did well, Alhamdulilah. Why did you start calling yourself the UK Rudy? I called myself the UK Rudy because I felt that our stories were so similar. 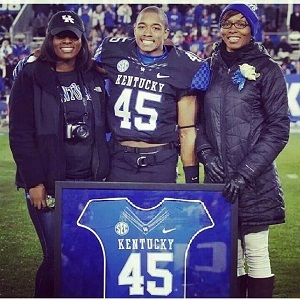 Trying to get into school, finally getting into school, trying out for the team and making it … Playing football at UK was a learning experience. I always worked hard and always gave my all, but unfortunately I didn’t get to see the field. In the movie, Rudy hits a point where he’s frustrated with not playing and quits the team. Did you ever consider quitting football because you weren’t playing? Definitely this past season. I was doing everything I could and giving everything I had and it was apparent that it didn’t matter and that I wasn’t going to get any playing time. That’s when I considered if it was worth it or not. But I thought about everything I had to go through just to get there. I told myself that no matter what happened, my goal was to get my Senior Day plaque with my jersey and to be at Pro Day. Looking back, has it been worth it? Alhamdulilah, it was worth it. I learned a lot about myself. Plus, one of my teammates became Muslim, Alhamdulilah. I can’t complain. I connected with the strength coaches and that’s my Plan B, inshaAllah. They offered me an internship. How did you help your teammate come to Islam? Really, it was all from Allah. Me and my teammates always get into philosophical and religious discussions. I was explaining Islam one day and my friend was on the other side of the room. He walked all the way over to hear what I was saying and when we were done he said, “Man, I’ve always wanted to be Muslim.” And of course I was blown away (laughs). So I gave him a Quran and told him he should read it over that winter break. We came back and he said he read it, but he was a little worried because he thought that he was going to have to give everything up cold-turkey. I told him that wasn’t the way of Islam and that he had to take everything in baby steps. We walked outside and then he said, “I repeat after you, right?” Alhamdulilah, many of my teammates are very receptive and interested in Islam. May Allah guide them. You said working with UK strength and conditioning is Plan B, so what’s Plan A? InshaAllah, I plan on trying to make it pro. I had a great Pro Day workout, Alhamdulilah. The only thing that may stand in my way is not having any (game) film. If I don’t get a call, one of my coaches may have a connection to an indoor league team. If that works out then, inshaAllah, I will do that for a year and tryout again at Pro Day next year. Throughout my football career I’ve never really had the odds in my favor, but Alhamdulilah, Allah has always made ways for me. InshaAllah, this will be the same. What do you think you can bring to a team? I believe I can bring excitement and passion. I’m very passionate on the field. I’m always excited, always hyped up, always juiced. Were you raised Muslim, or did you convert? My parents are converts. Pops used to be a Jehovah’s Witness and my mom was Christian. They learned about Islam in college and converted, so me and my sisters were born Muslim, Alhamdulilah. Even though you were raised Muslim, when did you know for sure — without anyone else’s influence — that Islam really is the religion for you? I was on the religion of my friends, as they say, until I decided to actually follow Islam for myself and not because of my parents. After my freshman year in college, I sat down and compared the major religions such as Christianity, Islam and Judaism. I also read a little into Hinduism and Buddhism. I didn’t have any Muslim friends. I didn’t care much for Sunday school or for going to the masjid, for that matter. 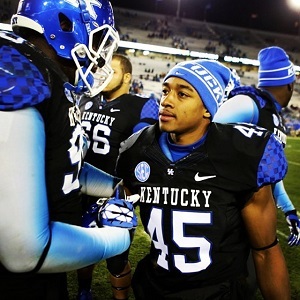 But after a few hard mishaps and life lessons, I decided that I wanted to walk onto the football team at Kentucky. I realized that what I wanted to do could only be done by Allah. So from that point on, I made up my mind that I would fast. And to be honest, the tryout went bad for me. I only had four balls thrown to me and I’m pretty sure I dropped two or three of them. But Alhamdulilah, my [40-meter dash time] was good and I ended up making the team. Have you had other instances in your life when football and Islam presented a conflict, like having to fast during a time of training? In high school it was tough. I think I only fasted maybe a few days. But Alhamdulilah, now it is easier. I talk to Hamza and Husain a lot for advice on things like this. They gave me their diet during Ramadan. You’ve gotten to know the Abdullah brothers? They came to Lexington during Ramadan a couple years ago when they were visiting 30 masjids in 30 days. That was my first time meeting them. We’ve kept in touch since then. You said you wanted to not just be a Muslim, but a good Muslim. What about Islam makes you want to be a good Muslim? The character of the Prophet (SAAS). Just how he carried himself and the narrations of incidents from his life are just mind-blowing. Has your religion ever been a problem or an issue in the locker room, with a coach, with fans, anything like that? No, not really. Everyone has had nothing but respect. I’ve had more questions and discussions about Islam than anything. People are genuinely interested in learning about Islam. The majority of people who ask me about Islam are my boys from high school. The last time they saw me I was acting a fool, and now they see a totally different person. It makes them ask what made me change. A lot of people would assume there isn’t much of a Muslim community in Kentucky. Was it hard for you to find like-minded brothers and sisters, either while you were growing up or since you’ve been in college? What advice would you give to young Muslim athletes? Young Muslim athletes should try their best to put Allah before their sport and he will take care of the rest. I know it’s hard out here, but something that will help is keeping good company. Surround yourself with other Muslims who have the same goals and aspirations, and most importantly, fear Allah.